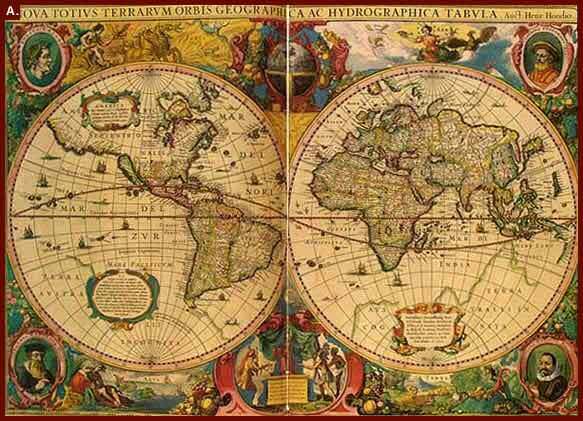 Henricus Hondius' ornately decorated world map first appeared in the 1633 edition of the Atlas that was originally published in 1595 by the Flemish cartographer Gerard Mercator and subsequently published by the Hondius family. 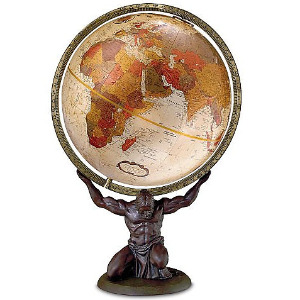 The world is depicted in two hemispheres, which are bordered by the representation of the four elements of fire, air, water and land as well as portraits of Julius Caesar, the second century A.D. geographer Claudius Ptolemy, and the atlas' first two publishers, Mercator and Hondius. Credit: Library of Congress. Our header image is the Vniversale descrittione di tvtta la terra conoscivta fin qvi from 1565, from the Library of Congress. Note that all social sharing features are ON in this forum. "The Geographer" by Johannes Vermeer Licensed under Public Domain via Wikimedia Commons.